As many of us earth and atmospheric scientists already know, seismic activity in Oklahoma has increased dramatically since 2009. This increase in earthquakes seems to be common knowledge. However, I was curious about some of the specific details and statistics surrounding this new phenomenon. According to the Oklahoma Geological Survey, or OGS, the northwest and central part of the state, which has historically had a low rate of seismic activity, has seen seismic activity rates jump by nearly 600% between the years 2009 – 2016 compared to the rate of activity from 2007 and earlier. 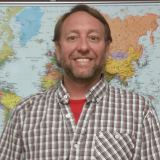 I recently attended to the 22ndAnnual 3D Seismic Symposium in Denver, CO, where the director of the OGS, Dr. Jeremy Boak, gave a presentation about the seismology of induced, or human caused, earthquakes in Oklahoma and how this new trend was effecting the state. Earthquake events in Oklahoma from 2009 - present mapped in Surfer color-coded by year. Dr. Boak mentioned a location on one of the OGS servers that contains all of the most recent earthquake event data that is downloadable, which can be found at http://www.ou.edu/content/ogs/research/earthquakes/catalogs.html. The earthquake catalog data, which was going to be a good source for my mapping project, contains a number of different attributes including the latitude and longitude of each seismic event, the depth, the date, and the magnitude of each event. This would prove to be all of the information I needed to create the visualization. To approach the mapping project, I downloaded the earthquake catalogs in CSV format from the OGS site. In Surfer, our contouring, gridding, and surface mapping software, I decided to create a post map layer for each of the year’s earthquake events and overlay them on US boundary files from the Golden Software website that contain the state and county boundaries. 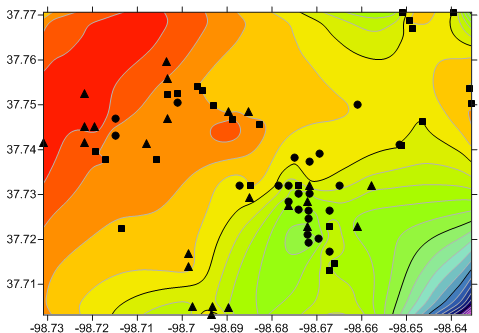 I then used the proportional sizing method in Surfer to make the earthquake events’ point size based on the magnitude of each event. This resulted in the image above, which seems a little cluttered due to the volume of events. I wanted to generate some comparative maps that show each year’s seismic events individually, so I created a new Surfer project that contains 8 different map frames, one for each year. I applied the same proportional symbology to each map frame and used the same base map layers to generate the figure below. As you can clearly see, the volume of events has been greatly increasing since 2009. Earthquake events in Oklahoma from 2009 - present mapped in Surfer by year for comparison. For the final portion of the mapping project, I wanted to incorporate the depth of these events by generating a 3D visualization of the earthquakes in Oklahoma. 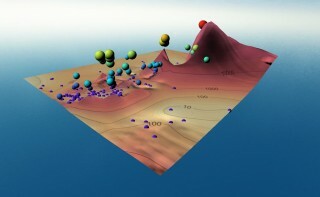 I used Voxler, our 3D modeling software, to visualize the data in true 3D space by creating a classed ScatterPlot where I based the size of each 3D sphere on the magnitude of the event. The earthquake events ranged from the surface to ~15 km deep. In the image below, you can see the most previous 8 years’ worth of seismic event data together, creating a very clustered and stunning look at these events. 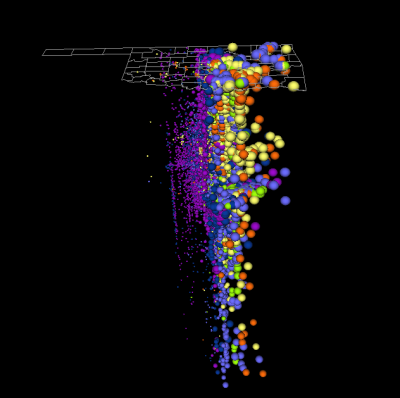 Earthquake events in Oklahoma from 2009 - present visualized in 3D using Voxler color-coded by year. Take a look at these easy to use mapping and visualization applications for your next mapping project! Thank you for sharing this blog!! Its looks great. Very impressive Drew, looks great. I think the wonderful thing here is that the applications of this are only limited by one's imagination. Thank you for posting your comments here, they are definitely appreciated. I am no expert in earthquakes, geology, or seismology; your comments are very helpful and enlightening. My blog post was intended to show how this interesting data could be displayed. The 3D visualization is only that, a representation of what is possible in our Voxler application. By no means was it intended to be an analysis piece or taken for any decision making purposes. If there is a location on the OGS website that we can point readers to has a more detailed, scientific explanation of the events occurring in OK, please send it our way and we will post it here. It is extremely important that you recognize and modify your post to show that only a very small fraction (70% of the injection is occurring. Recent substantial reductions in injection into the Arbuckle have a resulted in substantial reductions in seismicity in two major areas. In one small area, recent seismicity has concentrated along a single fault segment. 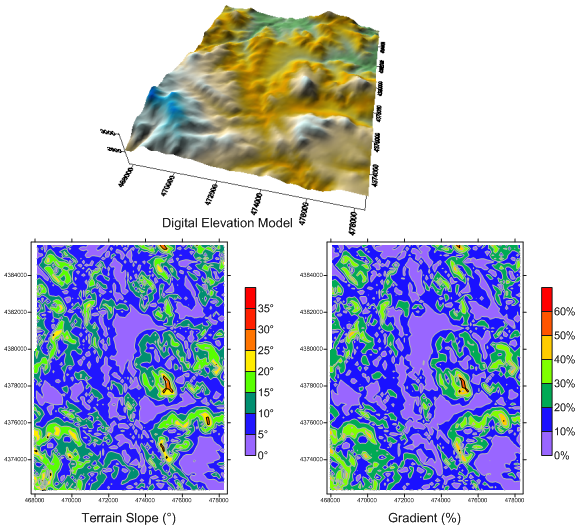 The 3D image is confusing, as it appears as if seismicity is occurring all over the state, whereas the maps clearly localize it over ~16% of the area of the state. The trend the commenter suggests appears to be some kind of artifact, as the lion's share of recent activity and large earthquakes is in the northwest. There is a great deal happening very fast regarding this issue, and visualization will be very important in deducing trends and patterns. Trying to represent the complex interaction of injection and earthquakes is very challenging, as you have no doubt recognized. Brittany It is extremely important that you recognize and modify your post to show that only a very small fraction (70% of the injection is occurring. Recent substantial reductions in injection into the Arbuckle have a resulted in substantial reductions in seismicity in two major areas. In one small area, recent seismicity has concentrated along a single fault segment. The 3D image is confusing, as it appears as if seismicity is occurring all over the state, whereas the maps clearly localize it over ~16% of the area of the state. The trend the commenter suggests appears to be some kind of artifact, as the lion's share of recent activity and large earthquakes is in the northwest. There is a great deal happening very fast regarding this issue, and visualization will be very important in deducing trends and patterns. Trying to represent the complex interaction of injection and earthquakes is very challenging, as you have no doubt recognized. Thanks for leaving your comments. I'm not sure if the distribution of the seismic events has a spatial relationship to the waste water well locations except that a majority of the waste water is being disposed of in the Arbuckle formation, which is a formation found under Oklahoma. This is not something that Dr. Boak discussed in detail. I noticed the image was reversed and flipped it to a better orientation. It should look more accurate. I cannot answer specifically about other contributing factors, as these also were not discussed at the symposium. The magnitude of the events were all scale the same from year to year, so the magnitude should be a good representation of the events.